traffic on the 405, originally uploaded by musiquegirl. Rep. Henry Waxman persuades lawmakers that a ban on federal funding for tunneling, which he pushed in 1985, should now be lifted. The move eliminates an obstacle to extending the line. WASHINGTON — Two decades ago, Rep. Henry A. Waxman wrote into law a ban on the use of federal funds to build a subway tunnel in the Fairfax district of Los Angeles, worried that construction could trigger an underground gas explosion. On Wednesday, the Los Angeles Democrat — now convinced that new technology could make drilling safe — persuaded the House to repeal his 1985 law, removing a major political obstacle to extending the line to the Westside. The one-page bill passed on a voice vote. The Senate is likely to follow suit soon, and President Bush is expected to sign the repeal into law. A subway extension from its western terminus at Wilshire Boulevard and Western Avenue to the ocean about 13 miles away would cost at least $4.8 billion and require years of planning, design and construction. Securing federal funds at a time of massive budget deficits and fierce competition for dollars will also be no easy task. “There is still much work to do before the subway can be extended,” Rep. Diane Watson (D-Los Angeles) said in a statement after the vote. Waxman sought the tunneling ban after more than 20 people were injured in a methane gas explosion at a West 3rd Street clothing store. But with traffic congestion growing worse, local officials led by Los Angeles Mayor Antonio Villaraigosa asked him to reconsider the ban. 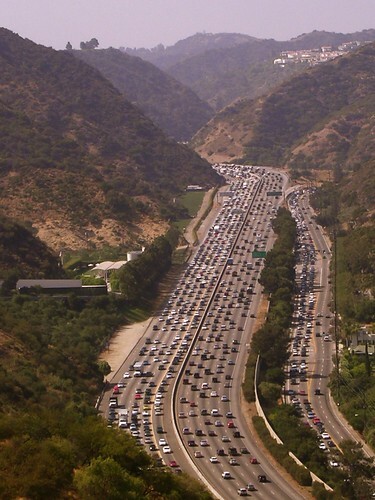 Villaraigosa noted that Los Angeles ranks first in the country in the amount of time that drivers spend in traffic jams — about 93 hours a year. A similar repeal measure was approved by the House last year, but died in the Senate in the waning days of Congress. California Sens. Barbara Boxer and Dianne Feinstein, both Democrats, this week introduced legislation to repeal the 1985 tunneling ban. “It’s time to make this project a reality,” Feinstein said of the extension. Will Waxman be introducing a repeal of gravity next? It’s time for a new Los Angeles Rail System! Join the MOVEMENT, spread the word, and add us as a friend!